Complete Formula for Bladder & Urinary Tract Health. Bladder Relief is the best Herbal Remedy for Bladder Discomfort and Overactive Bladders. All the ingredients within Bladder Relief work to cleanse the urinary tract and provide proper nutrition. Bladder Relief may be taken for fast acting relief of burning sensations and frequent urination. Bladder Relief is effective for both Men and Women. 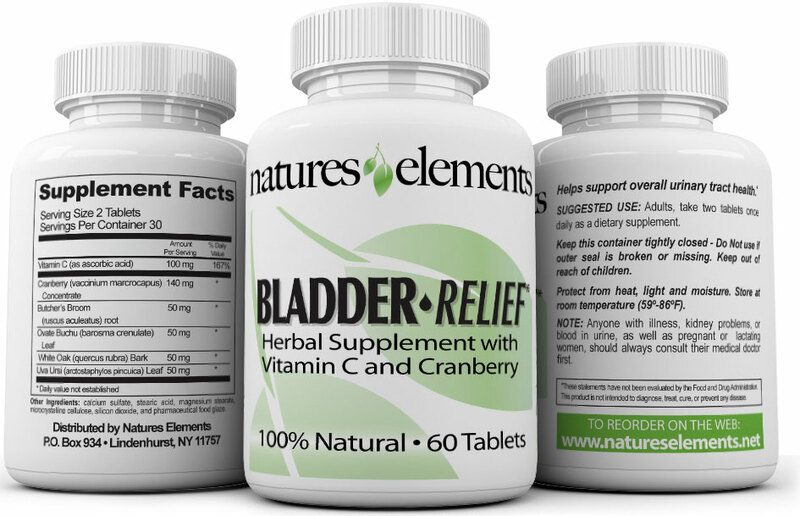 Nature's Elements Bladder Control formula helps support all over bladder and urinary tract health for long term relief. BLADDER RELIEF provides optimal support for overactive bladders and functions as a UTI remedy. The bladder is an important function in the body and suffering from bladder or UTI can be very unsettling. Many symptoms can arise with a mal-nurished bladder. Common symptoms include a burning sensation while urinating, along with frequent trips to the bathroom and the inability to control urination. These symptoms can be ongoing or re-occurring. However, with proper nutrition these symptoms can be eliminated and a healthy urinary tract can be restored. Common practices such as drinking 8 glasses of water a day and good hygiene practices can lead to a healthier urinary tract. But sometimes these methods are just not enough to maintain proper urinary function. It is difficult for some people to consume the proper vitamin levels for a healthy bladder from diet alone. Vitamin and Herbal Supplements provide increased levels of specific ingredients that target an aliment. 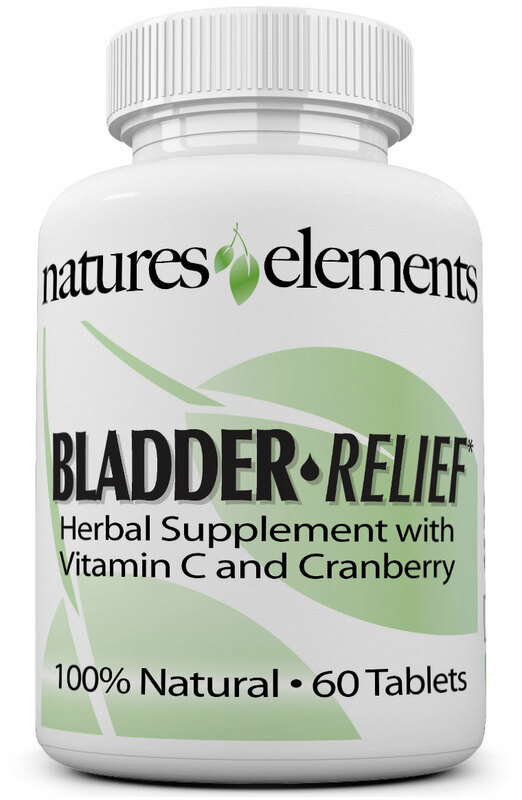 BLADDER RELIEF has been formulated with six different vitamins and herbs like Uva Ursi Leaf, Ovate Buchu and Cranberry that all work to improve bladder function. BLADDER RELIEF is a safe, non-addictive herbal supplement containing 100% natural vitamins and herbs selected to relieve frequent urination, burning sensations, urinary incontinence, and improve overall bladder health. BLADDER RELIEF may help relieve burning sensation or frequent urination. BLADDER RELIEF is most effective when taken consistently to help prevent urinary tract infections and frequent urination. After consistent use you may notice normal bladder control and function. Vitamin C helps support the body's immune system. It is a powerful antioxidant that produces an cleansing effect for the bladder through acidification of the urine. It acts as an anti-inflammatory support which reduces frequent urination and overactive bladders. It also helps to protect your body from harmful oxidation reactions caused by free radicals. Cranberry acts as a diuretic and urinary cleanser. Cranberry increases the urine's acid content, making it hard for bacteria to survive. This is because the acidity prevents the bacteria from adhering to the to the bladder lining. Without adhering the bacteria cannot multiply and they instead are flushed out of the system. Therefore cranberry is effective in preventing multiple ailments including urinary, bladder, and kidney. Cranberry is also high in antioxidants which remove free radicals which can cause cell damage. Cigarette smoking and air pollution are examples of what can cause an increase in free radicals. It have many cleansing properties. It acts as a mild diuretic that promotes urine flow and eliminates excess water weight. It helps release fluids urinary tract which in turn reduces frequent UTI's and promotes healthy bladder and kidneys. It stimulates and cleanses urinary tract. 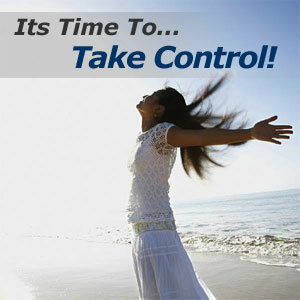 It is very effective in controlling urinary stoppage associated with bladder incontinence. It also may help reduce swelling of the prostate which can put pressure on the bladder. It has antiseptic properties which can alleviate painful urination. This powerful antiseptic and astringent may be effective in relieving UTI's. The tannins may prevent adhering bacteria. It also may help normalize bladder and kidney function. In Europe, Uva Ursi is widely used to help with UTIs. This is because it holds powerful antioxidant properties and acts as a powerful antiseptic and astringent. It aids by flushes toxins from the system and reducing excess water weight or bloating. By ridding excess water it strengthens urinary control, may help leakage and bladder incontinence. How Long Should I Take Bladder Relief? Bladder Relief is taken daily with two small easy to swallow tablets. Each bottle of Bladder Relief contains a 1-month supply. Although Bladder Relief may work quicker from one individual to the next, we recommend you use Bladder Relief on a daily basis for the recommended period of time. After consistent use for at least 3-4 months, you should begin to see and feel results. You will achieve continued results the longer you are on the product. Be sure to order an ample supply. Natural supplements are designed to create a holistic balance within the body and can take time to propagate through your system. Be patient stick with it...you’ll be glad you did! You can choose monthly or bi-monthly auto-ship by opting in from the Auto-Ship drop down menu below and choosing your shipment interval. In your first shipment you will receive a letter that states your next auto-ship date. After your receive 3 bottles you can do nothing and continue receiving regular shipments or you can cancel by calling us at 1-877-223-2626 or emailing at info@natureselements.net. There is no fee for canceling. Anyone with illness, kidney problems, blood in urine, on medications as well as pregnant or lactating women, should always consults their doctor before use. Not intended for use by persons under the age of 18. Keep out of reach of children. I want thank you for this product. I did not know what to do about my urinary tract infection. I had been to the doctor twice - antibiotics did not work - and I had to wait until my testing came back to see a specialist. And I did not want to do nothing. So I started to search online. I read about your product - Bladder Relief and thought I would try it out. It worked. And now I am taking it everyday as a preventative. I haven't had a bladder infection since I've been on Bladder Relief! Bladder Relief worked wonders for me. I used to get up so many times at night to go to the bathroom. It was becoming a problem. Now I sleep throughout the night, no interruptions! I used to worry about going to the bathroom every 5 minutes. Frequency and pain was starting to overcome my life. I had to do something. I tried Bladder Relief and it put all my symptoms at ease. I won't go a day without it now. I used to get headaches all the time. I was starting to think there was something seriously wrong with me. Ibuprofen was starting to not even be effective! But now that I am on a daily regiment of Relieve 1000 its like a new me. I can't remember the last time I felt this good for this long.